I don’t particularly care for the taste of tahini. 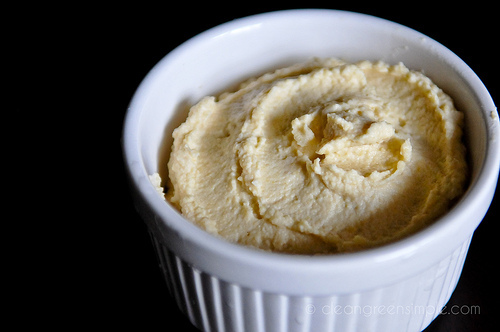 I mention this because there is tahini (which is a sort of sesame paste in case you’re unfamiliar) in most hummus recipes, including this one. I also mention it because halfway through making this I seriously thought it was going to be a massive fail, because you add the tahini first and then add the chickpeas a little at a time, so until you’re done the tahini is going to dominate. And if you don’t care for that taste (did I mention I don’t care for that taste?) you’re going to think you’ve just made a paste full o’ nasty. But! It gets better! And hey, if you like tahini then you’re pretty much golden throughout. Maybe I keep getting weird batches of tahini, I have to admit I haven’t used it all that many times. But I do love hummus, which is what this ends up as, so I was ultimately pretty pleased with this recipe. Just wanted to give you a heads up in case you got halfway through the recipe and thought maybe I was on some sort of drugs when I made it. Throw in a roughly chopped clove of garlic and blend thoroughly. Then add the chickpeas (or garbanzo beans, whatever you want to call them) a handful at a time, blending until smooth each time. 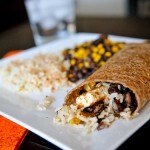 As you add the beans you can add water a tablespoon or two at a time to keep it nice and smooth. I ended up using about a cup of water. When you’re about halfway through blending in the chickpeas, add maybe a tablespoon or so of olive oil. Then finish blending it all together, adding salt to taste (I used about a teaspoon). And now you’ve made hummus! Yay for you! You can, of course, stop here. But if you want to be fancy you can do any (or all) of the following variations. 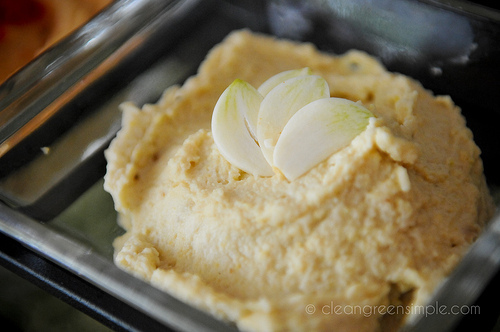 For roasted garlic hummus you will simply blend in (bet you can’t guess…) roasted garlic. 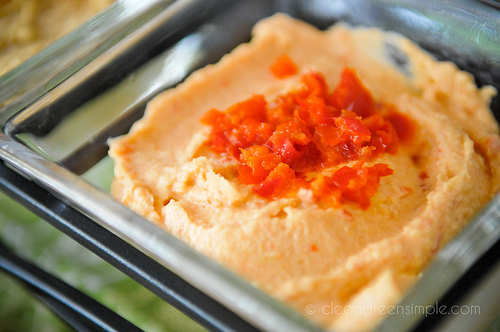 For roasted red pepper hummus, throw in a handful of (wait for it…) roasted red pepper. And for cumin and paprika flavored hummus you’ll add a head of broccoli. Or, you know, cumin and paprika. Just seeing if you were paying attention. That’s all there is to it! This makes about 2.5 cups of hummus, and especially if you start from dry chickpeas, that’s more than likely cheaper than the stuff you can buy at the store – and you’ll know exactly what ingredients are in it, which is always nice. 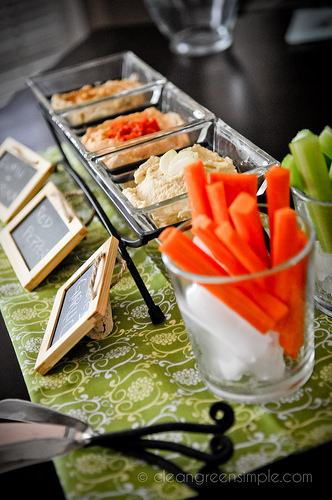 Oh, and one extra quick tip – when you serve crudités at a party, keeping them in a glass with ice on the bottom (the way I have it in that first picture up top) keeps them cool and crisp for a lot longer than just having them out on a dish. And it looks kind of nice, I think. The amounts listed below are for making all three flavors from one batch of hummus. If you want to make the whole batch one flavor, triple the ingredients for that flavor. Or skip the flavors altogether and just have plain hummus. Makes about 2.5 cups. 1 c. dried chickpeas (also called garbanzo beans), soaked overnight and then steamed for 25 minutes or so – or about 1 and a half 15 oz cans canned chickpeas. 3 cloves garlic, skins removed and roasted for 20 minutes at 425°. If you are starting with dried chickpeas, soak them in a bowl of water, covered with a dishtowel, for about 12 hours or overnight. Then steam them for about 25 minutes until nice and soft. If you start with canned chickpeas just skip that step. 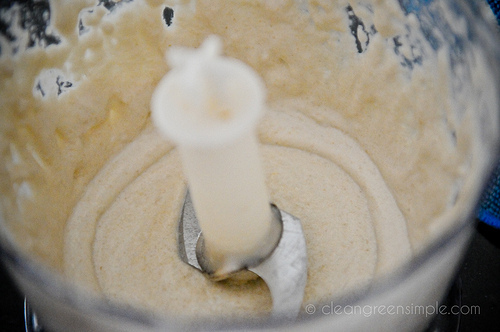 In a food processor or blender, combine tahini and lemon juice. Blend for about 30 seconds until frothy. Add one clove of garlic and blend until smooth. Add chickpeas a handful at a time, blending until smooth each time – if the mixture is dry add water and olive oil a little at a time until smooth. Continue until all the chickpeas are used (if you started with dry. If you used canned then use about 2 cups of chickpeas). Add salt to taste. 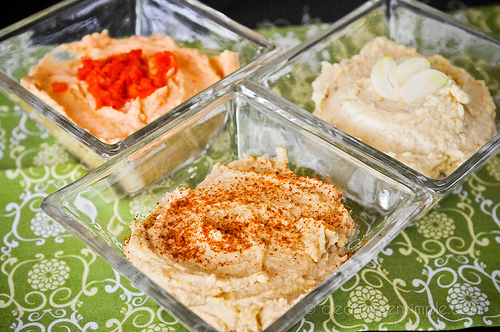 Divide hummus into three equal parts (if desired, see note above) and rinse and dry food processor. Blend roasted red peppers until they are finely minced. Remove a spoonful or two to use as a garnish, if desired. Add 1/3 of hummus to food processor and blend until smooth. Set aside. Rinse food processor and add 1/3 of hummus mix, along with roasted garlic cloves. Blend until smooth. Garnish with slices of garlic, if you want to be fancy. Rinse the food processor one more time and add the remaining 1/3 of the hummus along with cumin & paprika. Blend well. Garnish with a sprinkling of paprika. Serve immediately or keep covered in the fridge for a few days. I, too, love homemade hummus, and do not particularly care for the taste of tahini. I’ve found a solution that works great for those of us who do like the flavor of sesame: instead of tahini, I use sesame oil in place of part of the olive oil I use. 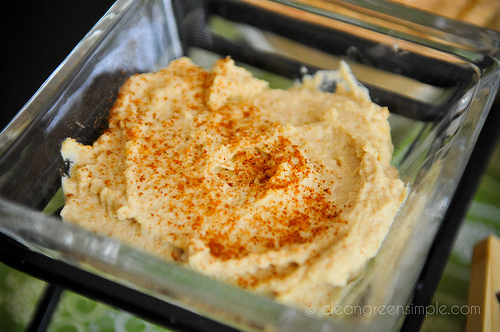 Adjust the amounts to your taste, and enjoy hummus with the gentle flavor of sesame! What a great idea about using Sesame Oil, I find Tahini a bit bitter for my tastes so will try this tip as I too like the taste of Sesame seeds.